This guide is intended to provide readers with ideas, how-to tips, and resources on building multiple income streams and generating extra income. If you are interested in earning more money and becoming less dependent on your job, this is the guide for you. On the other hand, this guide is not about getting rich quick or making easy money. Below are various sources and types of income to lay the foundation for this discussion. Primary Income – The most common form of income is the money you earn by working for someone. In return for your time and effort, your employer provides you with money in the form of a wage or a salary, plus benefits. Alternative Income – Money earned from sources other than your job. This can be money you earn from blogging, selling stuff on eBay, investment income, online business revenue, or other projects. Active Income (or Earned Income) — You are working for money. The key characteristic of active income is the cost of time. You must trade time (a limited resource) for money. If you stop, the income also stops. Passive Income (or Residual Income) — Money is working for you. This is the opposite of active income. Once you stop spending time on these income sources, the income flows don’t necessarily stop. Of course, there are varying degrees of passivity and it’s desirable to have highly passive alternative income sources. Create an overall strategy that allows you to diversify your income by building multiple income streams and purposefully moving toward more passive income sources. For additional information, please take a look at Building, Diversifying, and Shifting Your Income Streams. In my 5 stages of financial health article, I share an illustration that depicts Power Wealth Building. 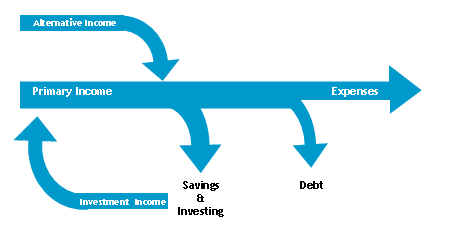 As you can see below, alternative income increases your total income and accelerates your wealth building capacity. Moreover, we associate financial freedom with independence from our primary source of income, so alternative income that can eventually replace primary income. Cultivating alternative income will take you a step closer to financial freedom. Next, I’d like to briefly touch on the question of career versus alternative income. I believe that building multiple streams of income should be the career of choice for the majority of us today. The higher you are on the career ladder, the harder it is to find an equivalent paying replacement job. 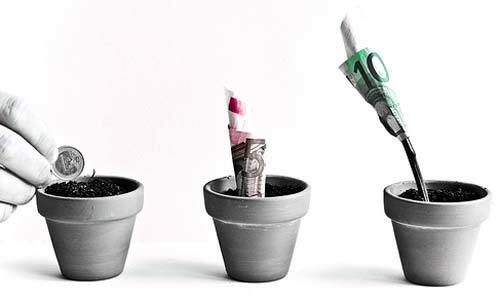 Multiple income streams will help you reach your financial goals faster. Multiple income streams give you a taste of financial freedom. For most people, financial freedom is occurs when you no longer need your job to cover your living expenses. Multiple income streams give you greater flexibility and leverage. You’re in a much more powerful position when you know that you are not 100% dependent on your job to make do. I believe that the concept of having a career is dead (with a few exceptions). It’s too risky to rely on one source of income, especially when most employers do not hesitate to cut jobs to make their numbers look good. It’s imperative for everyone to minimize their income risk by building multiple income streams. For additional information, please take a look at Building Multiple Income Streams as a Career. Building your primary income (i.e., your job/career) takes a tremendous amount of time, effort, and money as well. Many jobs require a college degree and some require even more education and training. I think 4 years of college is a lot of time, effort, and money! Compare all of that time to spending 3 hours a day for a year to build an income stream that could produce $1,000 a month. Once you set up an income stream (particularly a passive one) you could shift your focus to other streams and it continues to produce. For example, if you have $10,000 in a savings account earning 1% per year, you will continue to receive $100 a year even if you stop paying attention to that income stream. On the other hand, if you stop working, your paycheck will stop. I have a simple framework that can be used to create multiple income streams. There are endless possibilities when it comes to business ideas, and you can apply this framework to many of them. Passion — Do what you love. Expertise — Focus on what you are good at. Patience — Don’t expect to see the desired results right away. Persistence — Not everything you try will be successful; keep trying. Diversify — Don’t stop at the first thing that works; keep looking for more and different ways. Little by little — Trickles of money from many streams combine to provide a decent amount of money. Commitment — Some ideas take more effort than others. For additional information, please take a look at 7 Key Factors to Build Successful Income Streams. As we established above, it’s unwise to rely on one source of income and bet the farm on your career. One option is to become a part-time entrepreneur. Being a part-time entrepreneur allows you to maintain your regular income plus benefits, while at the same time giving you the opportunity to explore and expand your alternative income streams. As a part-time entrepreneur, you can afford to make mistakes and take on more risks. You can also go at your own pace as you develop your income streams. For additional information, please take a look at Why Should You Become a Part-Time Entrepreneur. Start with ideas related to things that you enjoy doing. Get away from the stuff that you do not like. And you’ll spend a lot of time getting your business going, so you might as well do something you like. Create proper business plan. Even if you have a very simple business, a good business plan can help keep you on the right track, providing you with direction. Small Business Administration (SBA) has some of the best resources on the web to get you started. At the very least, make sure your business is viable. Implement and execute. The best plans and ideas don’t mean a thing unless you can turn them into reality. It takes some courage and a lot of willpower to make things happen, and you need to be persistent in your efforts. Learn and improve. Even if your business fails, it’s a success if you learn something from the experience. Very few people are successful on their first attempt at starting a business, so don’t give up. Your task is to learn from past failures and turn that cumulative experience into an eventual success. If you want access to some great business ideas, head over to 40+ Alternative Income Ideas and Resources, where you’ll find over 40 income building ideas and resources. I’d love to hear your comments regarding this guide so that I can make it more useful. This is by far the best guide I’ve read regarding extra income. The things you share about working 3 hours for a set period of time to bring in a certain amount of passive income totally makes sense. Definitely more than working extra hours at a job that you could eventually lose. Thanks for sharing your knowledge with us. I really like how you break down the active vs. passive income streams. It is a little light on specifics, but will definitely get folks started in the right direction. I wish I would have come across a site like this 5 years ago! I definitely agree that you need to create multiple streams of income to survive, and the more passive incomes you can create the better. Thanks for the guide. I need to get back to work and start creating some of those streams of income. Passive income which is harder to achieve is certainly worth working towards. It gives you the ability to live life on your terms and not have the stress and dependence of a full time job!